In the middle of a sprawling suburban center where big box stores rule and rows of newly developed houses spread over green space, there is a small area dedicated to peace and tranquility. It is Professor’s Lake, and it’s a gem in in the middle of the sprawl. 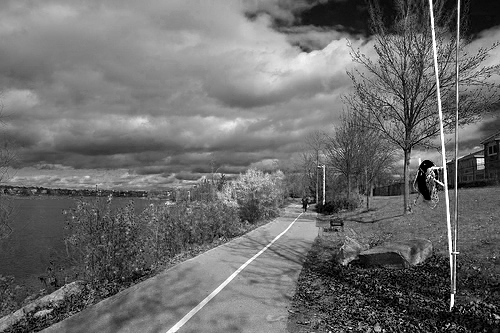 The lake is bordered by a commercial centre, a large hospital, expensive homes, and a park. On sunny summer days, it is flooded with people – kids run along the beach, dog walkers briskly walk their dogs, fishermen fish, families have picnics, and some simply read under the shade of the larger trees. Just before sunset – when dinner is done and kids are getting into bed – is the ideal time to visit the lake. The beach is closed, and so the hustle and bustle of the afternoon is removed. It’s quiet and peaceful. You can still hear the traffic in the background, and you can hear the clang of dishes or the laughtrack from television in one of the surrounding homes, but somehow, in at that time, you can filter it out. If there is a gentle breeze, you can hear the water rhythmically splashing onto the shores of the lake. If you focus on it enough, it’s all you’ll hear – and then it’s like you’re at the cottage, far from civilization, away from the city’s noise, stress, and pressures. Even though, 100 feet behind you, someone can be watching from their upper level bedroom window. In October of last year (2012), a body was discovered in the lake. Searching for the news item revealed that the lake had also taken the life of someone in 2010, and 2007. Professor’s Lake (like any body of water), it seems, has a dark side. It took away the lives of the very people that enjoyed it so much. It is beautiful, but dangerous. This dichotomy served as the inspiration for the leading track on the album, Oceanid.